Is the driver of the car in the back of a rear-end accident automatically liable? You are here: Home / Comparative Fault / Is The Driver Of A Car That Was Rear-Ended Free From Negligence As A Matter Of Law? This question came up twice last week. I decided to make it the Nevada Law Blog “Question of the Week”. 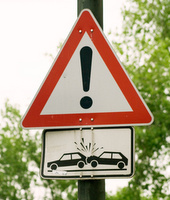 “Can the driver of a car that was rear-ended be a legal or proximate cause of the accident because of an abrupt or unexpected stop?” The Nevada case of Nehls v. Leonard, 97 Nev. 325, 630 P.2d 258 (1981) answers that question “Yes”. The facts of the Nehls case are pretty simple. Ms. Nehls is a passenger in the car behind. She sues the driver of the car ahead. She claims that the driver ahead made a sudden and unexpected stop, thus contributing her injuries. The trial court found in favor of the driver of car ahead saying that there was no evidence that that driver was negligent. The trial court granted summary judgment against Ms. Nehls and in favor of the lead car’s driver. Accepting all evidence favorable to the appellant, it appears factual issues exist as to whether respondent was negligence in stopping as she did, and as to whether such action proximately caused appellant’s injury. At a trial, the evidence may persuade the jury that respondent Leonard stopped suddenly and without adequate warning, that the stop unnecessarily exposed appellant to unreasonable risk, and that the stop constituted a substantial factor in causing the collision in which appellant sustained injuries. 97 Nev. at 327, 630 P.2d at 260. The court also explained that the car behind is not guilty of negligence as a matter of law. Quoting from the case of Montgomery v. Morgenson, 515 P.2d 714, 748 (Kan. 1973) the court said that unless reasonable minds can arrive at but one conclusion “whether the [second driver] was negligent is a question to be determined by the jury from all the evidence.” 97 Nev. at 329, 630 P.2d at 261. Questions regarding comparative fault can be tricky. Please contact Mike Mills at 702-240-6060×114 if you have questions regarding the fault of your insured under a particular set of circumstances. He will be glad to talk to you.